The real King on earth is society itself. It alone has real power. The rulers are hired servants, to whom power is delegated for a purpose. But when servant takes the crown and plays king, and the imposter is insane at the same time, as this it typically the case, society is in grave danger. This defines the present world long after the dialog was written, and still the imposter king plays games of fire flaunting its weapons with nuclear war threats. So, how shall we answer? Shall we lay ourselves down to die? The Principle of Universal Love answers the question. Under this principle it becomes the responsibility of society to shape the course of the present to meet the needs of the future. Even the tallest platform of civil government requires this. The institution of democracy, for example, is not just an institution defined by counting votes on election day. This part is the smallest. Democracy means, society taking responsibility for its welfare and security. Here lies 90% of the democratic process. If society has gained sufficient love for itself it would define the leading edge of politics and policy. Without it society is ruled by mediocrity instead, or worse is ruled by naked greed and fascist force and madness erupting into war. We still face nuclear war. We have faced the terror for more than half a century and are no closer to a solution than we were when the madness began. We have instead moved closer to war. In the days of aircraft delivery, an attacked nation had hours to respond to an attack. When the missile race began, the window between detection and impact had shrank to less than a single hour. In today's world of submarine-launched ballistic missiles and close-encirclement tactics, Moscow can be incinerated with 5 minutes from launch detection. In those 5 minutes the responses must be initiated, and this can only be achieved by a high degree of automation. On this thin hair hangs the fury of a firestorm that carries the destructive force of half a million Hiroshimas that very few people, if any, may survive. With this deep failure on its report card, humanity has earned itself a triple-minus F grade on the subject of love for itself. And even this grade is a gross understatement, considering that today's financial system, the looting system of empire that owns the finances of much of the world, has been rapidly disintegrating since 2008, which traditionally adds its own firestorms towards the triggering of war. For fifty years we have watched this build-up towards an extinction holocaust, hoping that time will cure our ills. This hasn't happened. While the universal love in society that could have solved the problem, isn't happening either. On this platform, humanity, will have vanished long before the ice age even begins. Nevertheless hope remains. Our hope rests on the human potential for repentance. Space for repentance means space begin a massive shift towards the Principle of Universal Love. No matter how likely this path may seem. This appears to be our only path left before us, as all other paths have failed. "I see very little of that kind of love," I said to Steve after a few moments of thinking about it. "As I said, mostly people don't give a damn about anyone but themselves. And that's not love." "That's not possible," Steve interjected. "If people truly cared about themselves as human beings, they would find that living without the Principle of Universal Love is not an option, but is dangerous poverty and inhumanity that will kill them. People cannot live that way. Humanity and its Principle of Universal Love are one. Without this principle humanity dies. While this is not recognized anymore in our time, all isn't lost yet, Peter. We, as society, do carry the responsibility for the world in which we live. This may yet become apparent when the dream world falls apart that people live in, and reality reasserts itself again. The dream of fascist prosperity is doomed to end. It is still possible for this reality to be recognized before the consequences of the long dreaming overwhelm society. One way or another, society will determine for itself what kind of world it will live in, and in which its living has meaning. If it drops this responsibility, it will suffer by default, as Germany did by allowing Hitler to rule. Yes, the German nation was trapped by Goebbel's propaganda. In a dream state this is possible, but in an a state of consciousness ruled by the Principle of Universal Love, this mental entrapment would not have been possible. Nevertheless, the German nation could not escape the consequences of its folly in which it allowed fascist masters to rule." "I agree, the environment of the Principle of Universal Love is a fragile environment in its early stages," I interjected, "but right now one can find hardly a trace of this principle anymore, certainly not as one should find it. Almost nobody cares, Steve." "That is why civilization will likely disintegrate in due course, as it did in Hitler's Germany. In Hitler's Germany, the people were not victims of Hitler. That came later. First and foremost they were victims of their own foolishness. If the people of a nation don't have enough love for themselves as human beings that they take whatever steps may be necessary to remove the defective leaders from power, then society isn't fit to survive, and it won't survive. A fascist leader in power is like an elephant in a china shop. If you want to protect what is precious, get the elephant out. The people in Germany failed to do this. We are failing the same way all over the world now, and that's only the beginning. In our modern world, people have become even more deeply corrupted than the people had been under Hitler. Now people sooner steal from one-another and tear each other down, by which they loose their civilization and the foundation for their existence, than to create riches for one-another by building a richer world. We are far from living in a democracy in which people take responsibility for their existence." "I know what you're getting at," I interrupted Steve. "You are saying that the train of all the historic tragedies was set into motion, not by men from Mars, but by society itself, when it allowed itself to become little people, underlings, paying homage to their empire gods, gods of greed, and force, and destruction. They honor Hobbes and Adam Smith today, the man who outlawed love. How much sadder can things get?" "Right, Peter. Don't love one-another, love that gold! That's the new prayer song! Are you surprised then that our government reflects this?" Steve asked. "That's what I see happening in America all the way to the top, to the very President of the nation," said Steve, "just as it is happening in many other places. What you see in today's world, would never be possible anywhere if society were like the Samaritan or even be supporting its Samaritans. Then society would do everything possible to uplift and defend its humanity anywhere in the world, and heal what needs healing. If there were a deep love in society for its humanity, society would create itself the type of government that would be mandated to provide education for all; universal health care; low cost financing for its advancing industries and its infrastructures for living, such as sufficient housing and efficient transportation infrastructures. Yes Peter, the Samaritan represents the General Welfare Principle, and the Principle of the Universal Brotherhood of All Mankind, and the Principle of Universal Love. This Samaritan isn't supported. This means that society isn't supporting itself. The Samaritan represents all of these principles, the only foundation that exists in the universe with the substance to support a human civilization. That foundation, although it was probably not scientifically understood, was most likely the platform that enabled humanity to survive the many ice ages it had to face throughout its 2.5 million-year history. Otherwise no one might have survived. Ironically our global society is now in the process of scrapping all of that, and expects to face the return of the Ice Age without it, and with a ten-billion world population that will be running out of food when the cold climate begins, and agriculture becomes disabled thereby. Society must be insane to expect to be able to survive that way. Society is in need of a deep reaching healing." "Are you saying, Steve, that the global society has become truly insane? 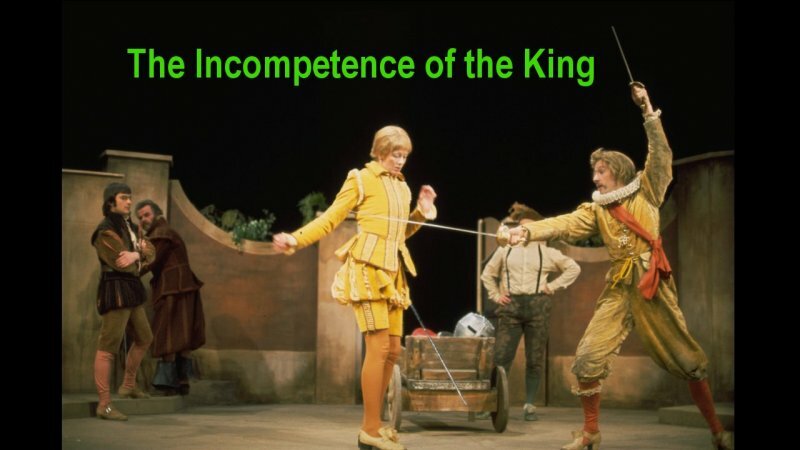 Or has it merely become incompetent?" Steve nodded slightly. "I am suggesting that society needs a lot of healing in both respects. Its incompetence is reflected in society electing an incompetent idiot to the highest office in the land. That's clear evidence of universal incompetence, isn't it, if it isn't insanity? The sad fact is that society has become grossly incompetent in the basic requirements for its survival. Our Constitution has all the safeguards included that give society the tools to keep its government on track, but when society becomes incompetent, what good are those tools? Who will use them in a world without sanity?" "Are you saying that the Samaritan represents what a competent human being is, and that Christ Jesus already understood two millennia ago the deep challenges that we face today?" Steve nodded again. "Why are you surprised, Pete? That man stood on the shoulders of giants. He stood on the shoulders of Homer, Aeschylus, Pythagoras, Solon, Socrates, Plato, Archimedes, Eratosthenes, and many others. He understood what a human being is. He also stood on the shoulders of his people's countless spiritual pioneers from Abraham to Elijah. He understood the royalty and divinity of mankind. He saw in the human being the image of the Supreme Being and the Intelligence that is reflected in all of the Universe. Anyone who lived in this age, and was a thinking human being, was moved to some degree by the scientific revolution that had been unfolding at this time, that was everywhere like the sand that gets into ones hair at the seashore. Do you think it would have been possible for someone like Christ Jesus to emerge on the world-scene, outside of this enormously rich humanist environment of scientific competence? That's not possible, Pete. People have always discovered their humanity in the processes of discovering the principles of the Universe that the eye cannot see. They found their humanity by living in the complex domain, the stuff that we talked about before, the world that Gauss lived in, the world of the complex domain of the infinite Mind.